FARGO, PAGETOWN — John Weaver has called Pagetown home his entire life. Weaver’s youthful memories are strong and center around helping his two uncles with farming chores. Weaver was a member of the last graduating class of Marengo High School in 1962 and immediately went to work for HPM Corporation. He was employed there for 43 years. His father owned property at the main crossroads. In 1970 he and his wife, Judy, built a house along the Delaware/Morrow County Line, about a quarter-mile south of his boyhood home. A cabin built in 1811 just north of the Delaware County line was the beginning of life in the southern tip of Bennington Township. According to a story penned by Dutch Collins, a settler named John Rosecrans built his home about a half mile north of Pagetown. Others soon followed, including the Olds brothers in 1813, who settled on the east side of Walnut Creek. After some skirmishes with Native Americans, they sold their land to the township’s first lawyer Allen Dwinnell, who became quite prominent in the early history. Today it remains a bit rustic with wooded areas, yet the presence of more than a dozen modern homes at Country Crossing and the Hoof Hearted Brewery on County Road 26 give the area a slightly more modern appearance. The Farmstead Restaurant is popular among locals and those traveling on Interstate 71. The area attracted Tami Russell, who renovated the former school house in 1996. “People were so excited about that. That school house is so cool. We loved restoring it,” Russell said. It was made from sandstone, with a brick front addition. They lived in Fargo for about 20 years. Russell sold it after her husband Jeff died in 2015. He had operated Fargo Herbs farm on the parcel of land and built seven greenhouses. 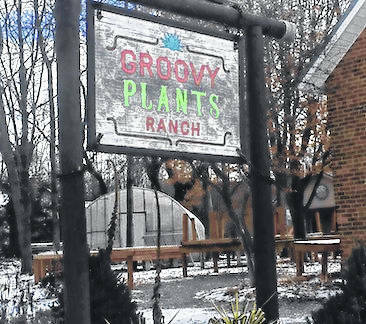 A year later Jared and Liz Hughes bought the school house and re-purposed the property into Groovy Plants Ranch. “I wouldn’t have sold it to just anyone. They were the right people,” Russell said. Russell had sold antiques and made felted mittens and hats in the shop. It sits at 4140 County Road 15 between State Route 61 and County Road 26. She recalls a coal shack and out house, along with paper souvenirs including a list of students’ names. Pagetown was laid out in 1827, and named for Isaac Page, the original owner of the town site. A post office bearing that name was established in 1866, and remained in operation until 1903. Co-founder of the Unity School of Christianity, Mary Caroline “Myrtle” Page was born Aug. 6, 1845, in Pagetown. She suffered from chronically poor health. She married Charles Fillmore, and together, they discovered a set of principles regarding healing and prosperity. Her parents were Marcus and Lucy Page, who founded Pagetown. Historical accounts tell us that in 1838 a village was platted and named Olmsteadville, in honor of its projector Francis C. Olmstead, who owned quite a tract of land at that point. The town never flourished as he had anticipated. Later it would be known as Morton’s Corners, which had a store, a post office and a tavern. In the early years there was quite a rivalry between Morton’s Corners and Pagetown, largely on account of their close proximity to each other, according to A History of Morrow County, Ohio. Morton’s Corners had a carding mill starting in 1847 and a foundry about the same time. A log schoolhouse was erected in 1819 about a mile north of Pagetown. Sally Dwinnell was hired as the first teacher, but she died the next year. 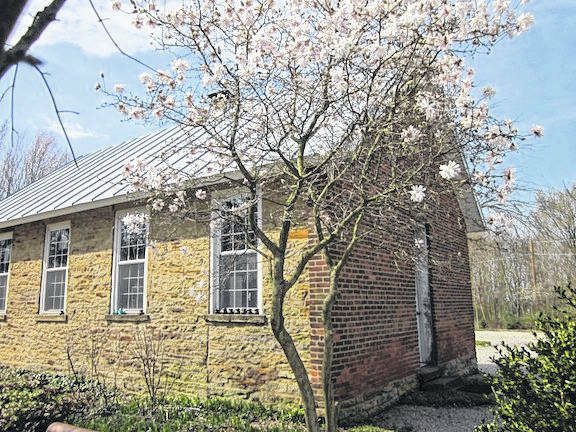 The old Methodist Episcopal church, built at Morton’s Corners in 1838, was later moved to Pagetown and converted into a barn. The old school house that became Fargo Herbs. Reach Conchel at 419-946-3010, extension 1806; or at aconchel@aimmediamidwest.com.